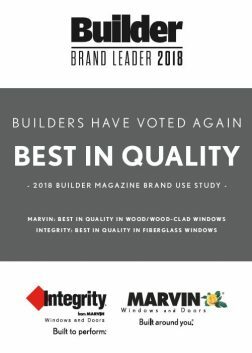 For the second year in a row, professional builders across the country have voted Marvin Windows and Doors as top quality product lines in the Builder Magazine’s Brand Use Study. An Annual survey of professional builders, the Brand Use study explores which brands are most often used and most highly regarded in the industry. Marvin Windows and Doors took the award for Best in Quality in the Wood/Wood-Clad Window Category, while Integrity Windows and Doors from Marvin has been named the best quality fiberglass window in the industry. Additionally, Integrity was voted the most used fiberglass window over the last two years. When it comes time to choose windows and doors for your next project, go with the brands that professional builders trust the most: Marvin Windows and Doors, and Integrity Windows and Doors from Marvin. And when it comes to Marvin and Integrity products in Georgia, North Carolina, and Nashville, TN, there’s no better place to start than AVI Windows and Doors. Whether you’re a homeowner looking to replace, or a professional builder looking for a long-term partner, AVI has the experts to help make your life easier. We’ll match you with the perfect products, the perfect services and be with you every step of the way. So get started today by contacting AVI Windows and Doors.